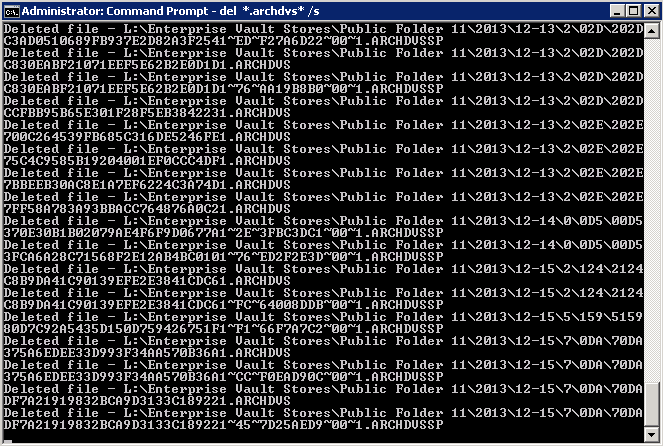 If you’ve tried to migrate away from Enterprise Vault in an environment that uses ‘collections’, chances are you’ve had issues with ARCHDVS, ARCHDVSSP or ARCHDVSCC files at some point. This is fairly common and is fairly easy to see why it might cause an issue. EV collections are standard Windows CAB files used by the EV collector to combine multiple archived items into one file. This is used primarily to save on disk space and increase backup times as the number of overall files on disk is reduced. It’s a great idea in theory and under normal operating circumstances works fine. When an item in these collections is required (requested by a user) it is extracted from the collection with an ARCHDVS, ARCHDVSSP or ARCHDVSCC extension. This stays extracted until the collection process runs again (usually once a day out of core business hours). What is meant to happen is that when this runs it cleans up the ARCHDVS, ARCHDVSSP or ARCHDVSCC files to regain the disk space. The problem comes when you’re furiously migrating away from Enterprise Vault and are trying to get the data out of EV as quickly as possible. In this case you can cause so many items to be extracted from the CAB files that you simply run out of disk space. The EV Admin service monitors disk space and once the disk space reaches 1–2%, it takes all the services offline. Bummer. At this point you cannot manually run the collector service as it requires the EV Admin service to be online to perform the action. To get around this you need to manually delete the ARCHDVS, ARCHDVSSP or ARCHDVSCC files and reach more than 1–2% free space in order to be able to bring the services back online so you can continue with the migration. The solution involves deleting A LOT of files. This is very simple, but fairly scary. Obviously there are loads more ways of incorporating this solution depending on the scale of your environment. I have some drives that are so tight that whilst we are migrating I have a batch file triggered via a Scheduled Task working away 100% of the time to remove all the ARCHDVS* files.